Synopsis: Srinivasa Rao (Nagaiah) works as a music teacher and loves the beautiful Bhagya Lakshmi (Malathi). Unfortunately, her parents have already arranged for her to marry the straight-laced Vishwanantha Rao (Giri). Later, when the lovelorn music teacher rejects the advances of the dissolute Kamakishi, she starts to spread vicious gossip about an alleged affair between Rao and Lakshmi, resulting in the lass getting thrown out of her house. In spite of his passionate unrequited love, the music teacher labors tirelessly to reunite his love with her husband. Synopsis: This religious drama about the life of saint poet Bammera Potananmatya (also called Bhakta Pontana), who was a farmer until the god Rama came down from the heavens and told him to translate the holy text Bhagvata Gita from Sanskrit into Telugu. Soon after completing his life's work, Potananmatya is told to dedicate his work to his king. When he balks at the sovereign's inveigling attempts to claim credit for the work, the king sends out the troops. Hanuman -- the trickster monkey god -- saves Potananmatya and his family from the royal onslaught. As the troops mobilize to destroy the author's house, the king's palace gets magically trashed instead. Synopsis: The King prays for progeny and is blessed with children, the youngest of who is named Bala Nagamma. She is married off to Karyavardi Raju but is kidnapped by Mayala Marathi who turns her into a dog and whisks her off to his cave. Once there, he tries to take advantage of her, but she keeps him away quoting some Holy Rites and Pujas that she is involved in. Fearful, she is a prisoner in the cave for 14 years, where the Fakir's mistress, Sangu, is jealous of his obsession with Bala Nagamma. In the meantime, her son [Balavardi Raju] grows up and gets to know the truth about his mother. He seeks the Fakir out and defeats him. Synopsis: This tale about fabled court jester Temali Ramakrishna. The film opens with Ramakrishna (Master Raju) as a child being appalled after learning that the twice-married lecher Karanam is about to marry the nine-year-old Saubhagyam. He dresses up as the child bride, foiling the wedding and making a mockery of the groom. Years later, the adult Ramakrishna (S.P. Lakshmana Swamy) lands a job as the royal poet for the court of Krishnadeva Raya, where the scheming Brahmin soothsayer Tatacharya tries to manipulate the sovereign to his own ends. 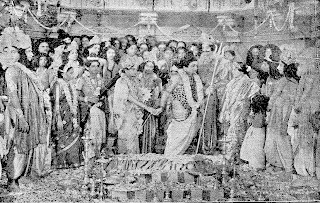 When the king's mother dies while eating a mango, he predicts that the royal mother's soul will not rest until the king gives every Brahmin a mango made of gold. Ramakrishna replies that his mother died with a longing to be seared with a hot poker, and then arranges for every Brahmin to be branded. Plot: Marital melodrama promoting the image of the ideal woman as a long-suffering and self sacrificing wife. Santha (Kannamba) is the exemplary but still childless -wife of Krishna Rao (CSR Anjaneyulu). When all rituals fail, she accepts her evil sister-in-law Durgabai's (Seshamamba) suggestion that her husband take a second bride, Kamala (Hemalatha). Durgabai and Kamala then combine to eject Santha from the house in spite of her sudden pregnancy. She gives birth to a son but gets separated from the child, which is raised by a local zamindar. Kamala turns out to be the real villain and sends an assassin to kill the child. Eventually the husband has a change of heart and rescues the child himself; Kamala obligingly commits suicide, thus restoring the original happy couple. 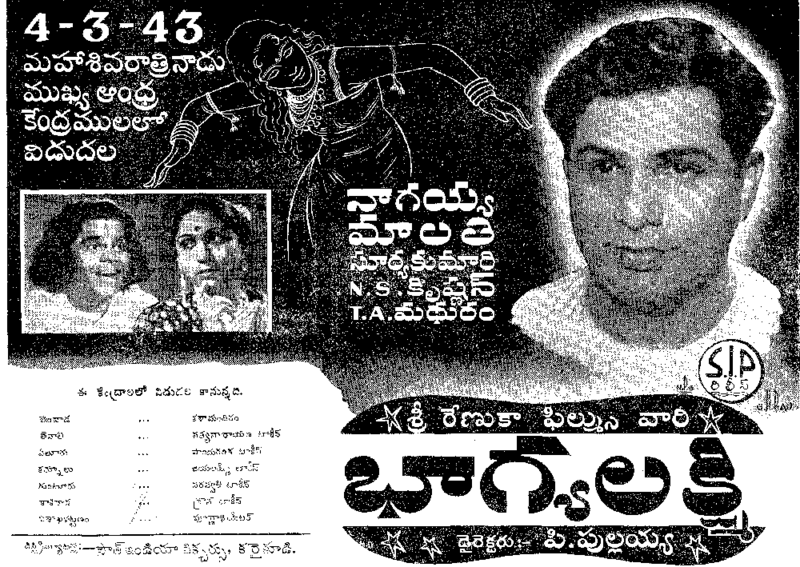 Trivia: This was the first film on Sobhanachala Pictures. Previously it was Jaya Films. 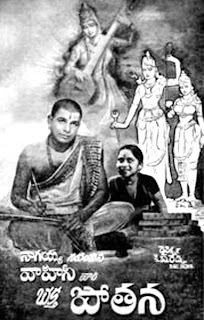 A scholar and a literary personality Buggapatnam Tirumala (BT) Narasimhachari, who had only one hand, was at that time editor of the popular magazine, 'Dhanka'. He later edited the Bangalore based 'Prajamata'. 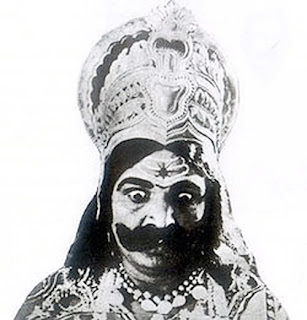 Ramana Rao and Samrajyam who acted as Lord Vishnu and Saraswathi were husband and wife in real life. Synopsis: Venugopala Murthy returns from England after completing Barat-Law. His mother Mangamma and sister Sita are overjoyed. Venu is attracted to the servant Lakshmi who stays with the family. One night Venu takes advantage of the sleeping Lakshmi and promises to marry her. Soon Venu has to leave the city. He stays with his maternal uncle Balaramaiah who had funded his education assuming that Venu would marry his daughter Vimala. Though hesitant at first, Venu agrees to marry her. Mangamma and Sita take a reluctant Lakshmi and her brother Rangadu to the city. Venu explains his predicament and offers some money to Lakshmi that she spurns. 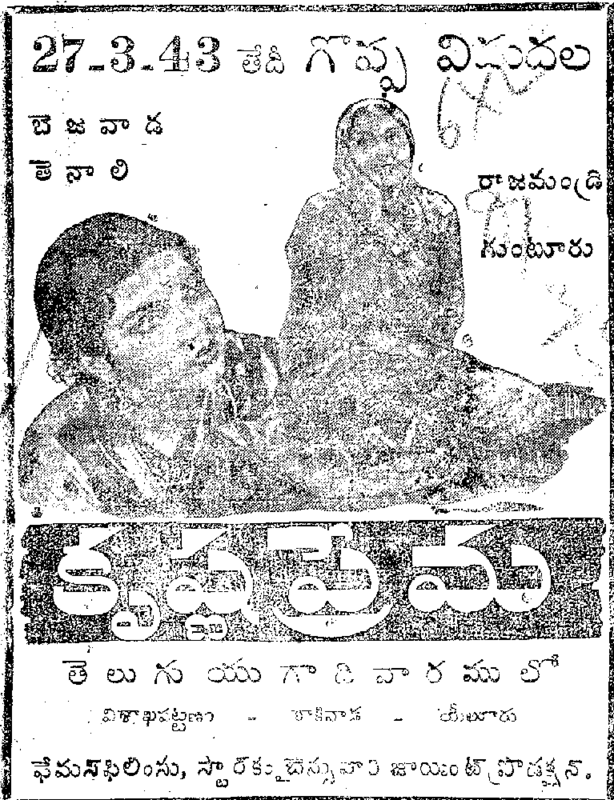 Later when her father Venkaiah arranges her marriage, pregnant Lakshmi leaves the house. Vimala elope with Sukumar. Venu confesses to his mother. The kind hearted Mangamma sends him to bring Lakshmi back. Mean while Lakshmi take refuge with Haridasu's family and delivers a child. After several hardships, Lakshmi reunites with Venu. Synopsis:Five year old Radha's dying mother hands the custody of Radha to the devadasi Sridevi who promises henceforth she would lead a pure life. Sridevi teaches the child the virtues of a house wife. In the school Radha befriends Mohan and as they grow love blossoms between Radha and Mohan. Mohan takes her to the temple and pledges before the deity that she was his 'dharmapatni'.